For the last two months, we have featured a trilogy of films that have pushed the boundaries as to what a romantic movie should be. Now, in the third and final installment, our feature for Movie of the Month about the "Before" trilogy comes to an end with Before Midnight. In 2013, director Richard Linklater assembled most of the same crew and of course the cast of Ethan Hawke and Julie Delpy to pick up their story nine years after Before Sunset left off. 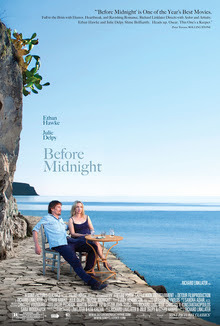 This time, Before Midnight, is set in Greece and they are a family now going through major marital problems. They are at different career points -- he is a successful writer and she is at a crossroads. He wants to move their family to Chicago to be near his son, who he had from a prior relationship, yet, she wants to stay in Europe. As the film carries on, so does the division between them as they blow up at one another leaving the audience to see how raw and real they get. Like its predecessors, it is shot in a magnificent European location and continues to be an honest and profound look at dating, commitment, and above all, love.